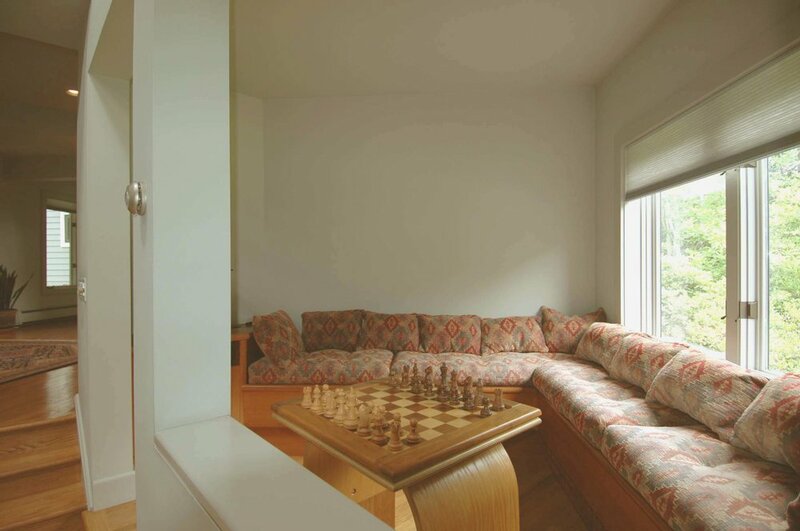 His wishes for a dramatic "public" space mixed with intimate, private "getaway" areas in the house were fulfilled with a dramatic two story Living Area that was made visually accessible from the first as well as the second floor circulation spaces. As a contrast, the Library is tucked away at the end of the first floor hall and has the only wood burning stove in the house. 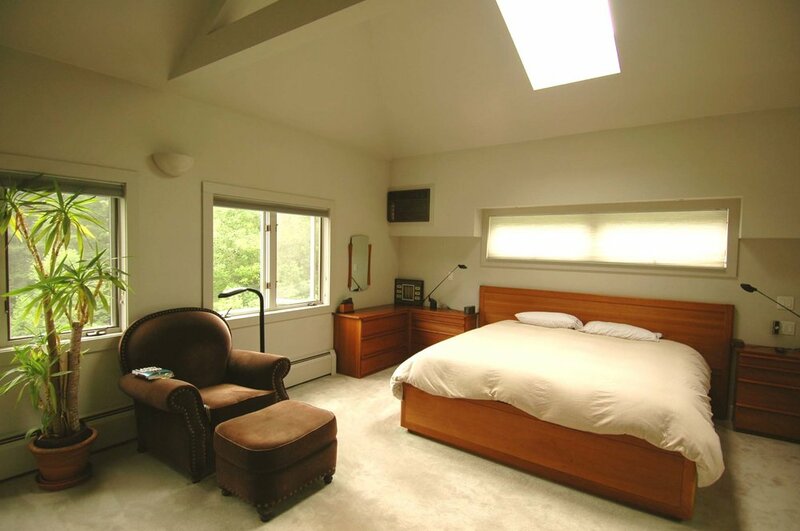 It is connected to the Master Bedroom directly above it by means of a private stairway. 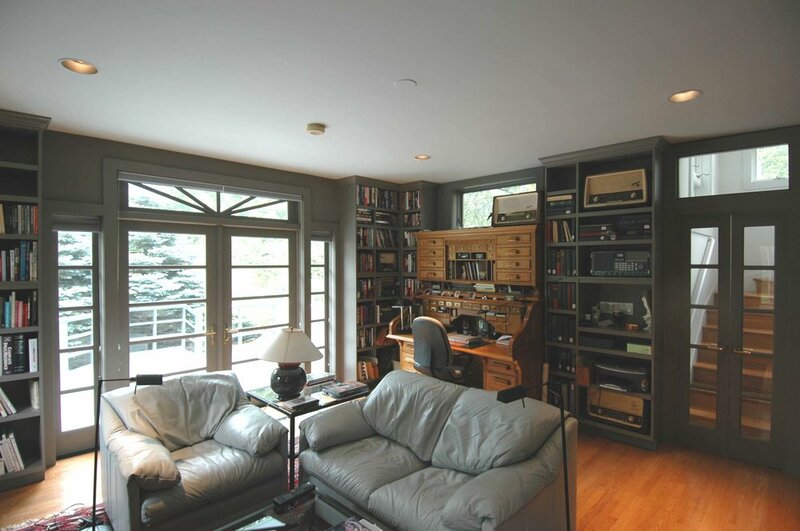 This gives the owner a private and secluded area within an otherwise large house. The Kitchen is fitted with the latest in commercial cooking technology and opens into an adjoining greenhouse structure that sometimes serves as an informal dinning space. The Dining Room located on the other side of the Kitchen is used for more formal dining occasions. A spacious three car garage serves to fulfill the owner's requirements for storing his automobiles and associated paraphernalia. Mechanically, the house incorporates a solar hot water system to preheat all water required for washing. 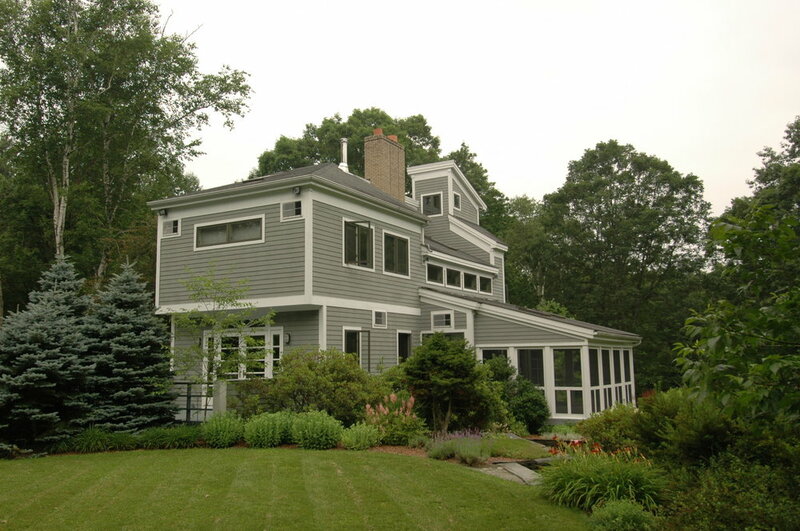 An existing residence we designed fifteen years ago for a bachelor, was purchased by a New York couple as a weekend residence for a family of four. 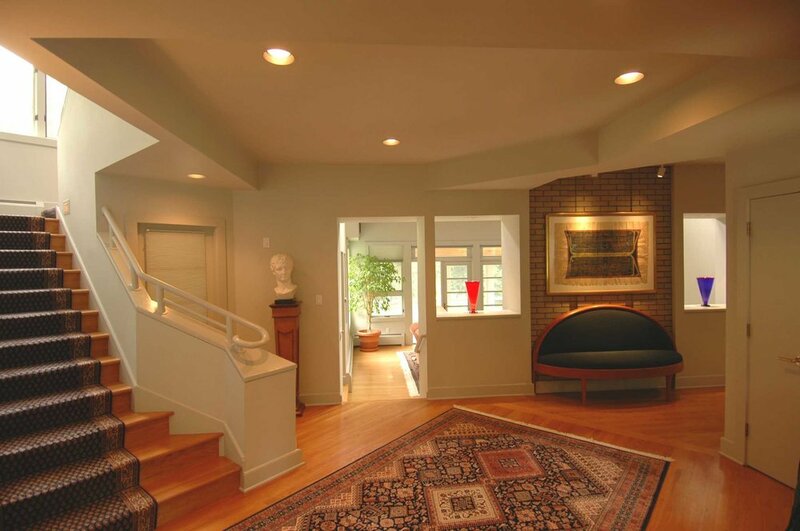 The expectation of a great many house guests dictated the alteration of two bays of the existing garage into two bedrooms and an additional bath. 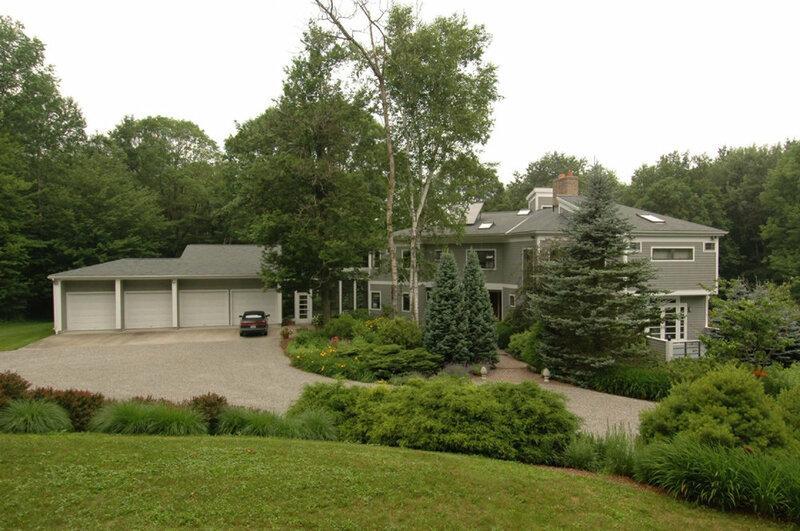 Of course, this also required a new septic system for the existing four Bedroom house to become a six bedroom residence. 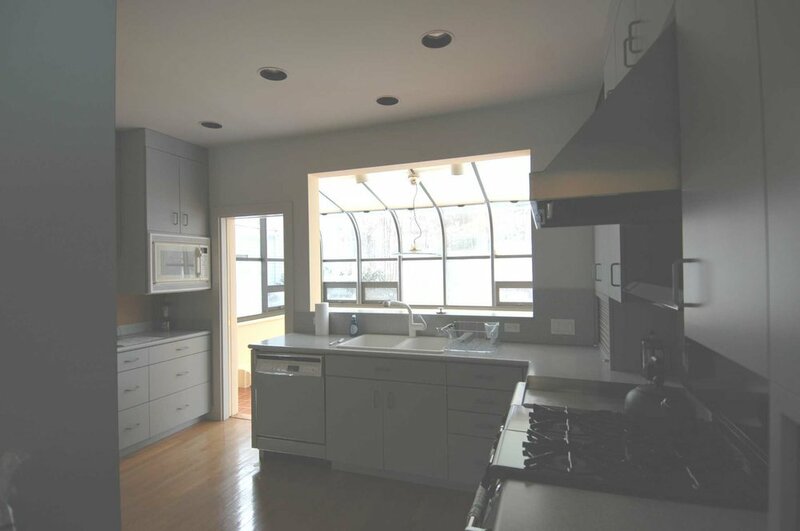 Alterations also included the formal Dining Room adjacent to the Kitchen as well as the existing greenhouse Breakfast “Room” be incorporated into a large Eat-in Kitchen space. Minor alterations to the Living Area, The Library and Master Bedroom were also part of the work to transform this bachelor residence into a part time residence suitable for a family of four with many expected visiting house guests. Converted existing greenhouse into new seating area, removed wall between existing dining and kitchen to expand overall kitchen area. Alternate angle of newly expanded kitchen area.